The Russian flag is a combination of three colored bands of equal width: the upper – white, middle – blue and lower – red. But what do the colors of the Russian flag and what they symbolize? The official interpretation of the meaning of white, blue and red stripes on the Russian tricolor does not exist. However, there are a number of "unofficial" interpretations of the meaning of the colors of the flag of Russia. According to the most popular of them the white band represents peace, perfection, purity and innocence. The blue color on the flag of Russia is the colour of constancy, faith and fidelity. Also blue is the color of the mother of God under the protection of which is country. However, Russia is still considered a secular state, so to directly associate the color blue with religion is not quite correct. Finally, the red stripe symbolizes strength and energy, as well as the blood shed for the Motherland. Since the Russian tricolor appeared more than three centuries ago, of course, there are "historical" interpretation of the meaning of the white-blue-red flag. According to one of the colors of the stripes and their relative position is a reection of the structure of the world from the point of view of the ancient Slavs. In this case, the lower red stripe of the tricolor corresponds to the physical world; blue - heavenly world and the upper, white is divine. 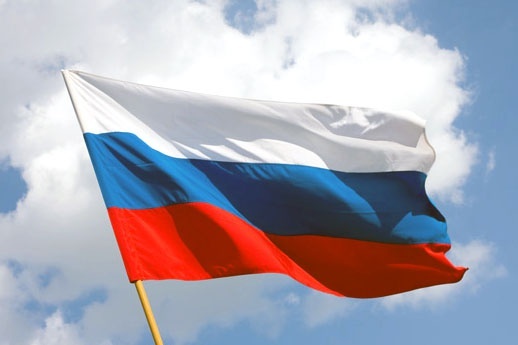 The white color on the flag of Russia - freedom, blue - faith, red - statism. This is a very popular version of the "reading" of the tricolour during the existence of the Russian Empire. Another "great" interpretation of the meaning of the colors of the flag is that the three stripes of the tricolor represent the unity of the three Slavic peoples. In this case, the white stripe on the Russian flag symbolizes Belarus, blue - little Russia, and the red is Great. Universal "recipe" to "read" the values of the colors of the national flags of both Russia and other countries, does not exist. Color values can be spelled out in official documents, but it is absolutely necessary. However, often enough to "decipher" flags refer to the heraldic interpretation of the color values. What is the meaning of the heraldry in white, blue and red? White color in heraldry is traditionally called "silver" or simply "silver". The use of white signifies purity and innocence, virginity, purity. Also, this color symbolizes wisdom, serenity and reliability, truthfulness and frankness. In alchemy silver meets pearl, and in astronomy is the Moon. The element of white - water. The color blue in heraldry is usually called "azure" or "azure." It is a symbol of beauty and grandeur, glory, and honor, gentleness, faithfulness, sincerity and honesty. Perfection, greatness and chastity - is also a "blue" quality. The element of this color - water planets - Jupiter, in alchemy means blue sapphire or tin. Red, aka - chervleny. Scarlet in heraldry, traditionally symbolizes bravery, courage and boldness, and fearlessness, love and generosity. In addition to the values of the red color refers to the right, fire and heat. A red background may indicate the blood shed, political or religious views. In alchemy correspond scarlet ruby and iron, in astronomy - Mars. The element of red of course is fire. The law on the State flag of the Russian Federation, shades of white, blue and red colors of the flag is not set. However, according to GOST color of each bar should correspond to one of the rooms of Satin colors or Pantone Ocamlgraph. State authorities usually specify when ordering the following symbols of the Russian flag colors the following colors according to Pantone colors: white with no additional colors, blue 286С, red 485С.